Map reference SK 470074 Click here for map. Click on the links below for map and route details for each leg plus GPX files if you have GPS. As in previous years those cycling to and from the event in addition to riding one or more legs have their total cycling mileage for the day on their certificate. You can download an entry form and a parental consent form (for those 17 years of age or under). Further details from John Allen (01530) 243384. Meriden, between Coventry and Birmingham, is the proclaimed Centre of England where a national War Memorial dedicated to cyclists was erected on the village green in 1921. The 97th Cyclists' Memorial and Celebration of Cycling Service will take place at 11am around the Cyclists' Memorial on the Meriden village green. 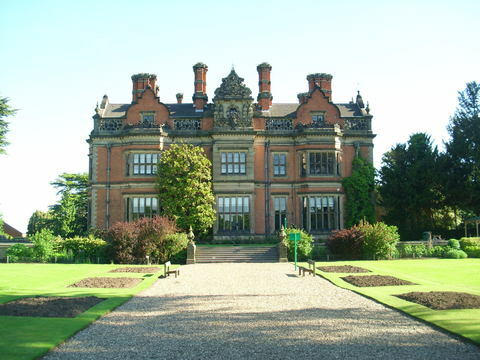 CTC members are invited to camp again in the beautiful grounds of Beaumanor Hall, Woodhouse near Loughborough. There are excellent facilities and a variety of led rides will be available. Click here for Information sheet, programme and booking form. You can read more about the Beaumanor Rally here. Start time: 8am Latest finish time: 8pm Cost £22. A circular route into Leicestershire and Northamptonshire around the source of the Warwickshire Avon, in Naseby. The route will take you along some of our favourite lanes in gently undulating countryside and uses village halls for the refreshment stops. Refreshments are included at the start (Binley Woods), at the mid-morning break (Sibbertoft), at lunch (Great Easton), at the afternoon break (West Haddon) and at the finish (Binley Woods). Further details on CTC Coventry Website. The New Forest Cycling Week was founded in 1975 and for 35 years was based at the Forestry Commission Roundhill campsite near Brockenhurst. In 2010 the New Forest Cycling Week moved to the UK Youth Activity Centre at Avon Tyrrell Manor near Burley. The Rally attracts approximately 200 attendees each year. It is an informal rally for cycle campers, free from pressure and over-organisation, yet offering activity for all those who wish to join in. It's a rally for cycling families, small groups and individuals whether new to camping or, indeed, more experienced and age is immaterial! There is plenty to see or explore in this unique area. The many minor roads and tracks make enjoyable and safe riding for families and younger riders and there is normally something taking place every day. Various on site activities take place during the evening. Other activities during the week include children’s time trial, swimming, Bar-B-Q and on Wednesday use of the Avon Tyrrell adventure facilities for children using their instructors. AGM at The Soar Bridge Inn, Barrow upon Soar LE12 8PN. Any Notice of Motion should be submitted in writing to the Hon. Sec. at least two weeks prior to the meeting. The famous Mince Pie Cycle Run will again be taking place at Belton Village Hall (10.30am to 12-30pm). Tombola in aid of Rainbows Children's Hospice. Click here for map and further details.